Euroa is a substantial township and rural district on the route between Melbourne and Albury, 130 km north-east of Melbourne. Euroa is situated on Seven Creeks, a tributary of the Goulburn River. Seven Creeks has its headwaters in the Strathbogie Ranges south-east of Euroa. The headwaters comprise seven streams – hence the name. One of those streams is Faithfull's Creek, named after the pastoral overlander William Faithfull who brought stock to the Euroa area in 1838. The area was known to overlanders by its having been explored by the New South Wales Surveyor-General, Major Thomas Mitchell, in his Australia Felix expedition, 1836. In addition to William Faithfull two other pastoral enterprises were important in Euroa's beginnings. The Seven Creeks pastoral run of 28,300 hectares, 6 km south-east of Euroa, was taken up by the Templeton/Forlonge family interests. Janet Templeton, nee Forlonge, and her sister-in-law Eliza Forlonge imported Saxon sheep to Australia, and stock was overlanded from Goulburn to Seven Creeks in 1838. In 1851 William Forlonge, Janet Templeton's nephew and Eliza's son, acquired the Seven Creeks run. Their names are commemorated on a memorial as the persons who imported the first fine-wool sheep to Victoria. The second pastoral pioneer was James Kirkland, the holder of the Urowa pastoral run (1844-51), which in time became the name of the town and district. Urowa, or Euroa, is thought to be derived from an Aboriginal word meaning push or joyful. The former is the more likely. Euroa was not one of the two prescribed or surveyed towns along the Melbourne to Sydney road, but the bridging of Seven Creeks in 1854 for improvement of the route to the north-east goldfields was the genesis of a township. The town was laid out north and south of Seven Creeks. Early settlement favoured the north side, but the building of the railway station and a levee bank for flood protection drew development to the south side. An Anglican school was opened in 1856, and the town's first church (Anglican) opened in 1857 and a Catholic church opened in 1867. All were on the south side. A flour mill was opened in 1873, the year the railway was opened. 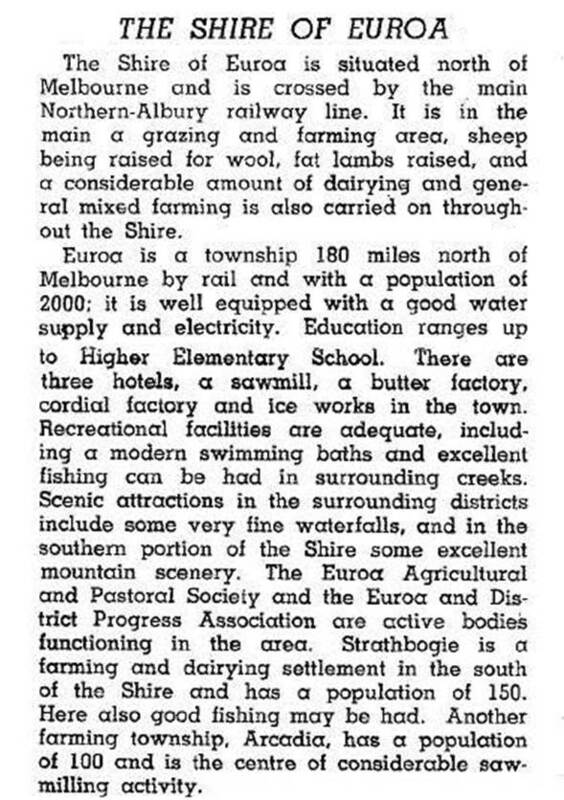 Further south in the direction of Strathbogie, additional farm selections were taken up, strengthening Euroa's town economy, its role as a place of supply and as a railway transport depot. A National Bank was opened, soon to be the scene of a hold-up by the Kelly gang on 10 December 1878. In the 1880s the churches rebuilt their edifices, the large Euroa and North Eastern hotels were built, and the National Bank constructed an imposing chamber at the corner of Binney and Railway Streets. 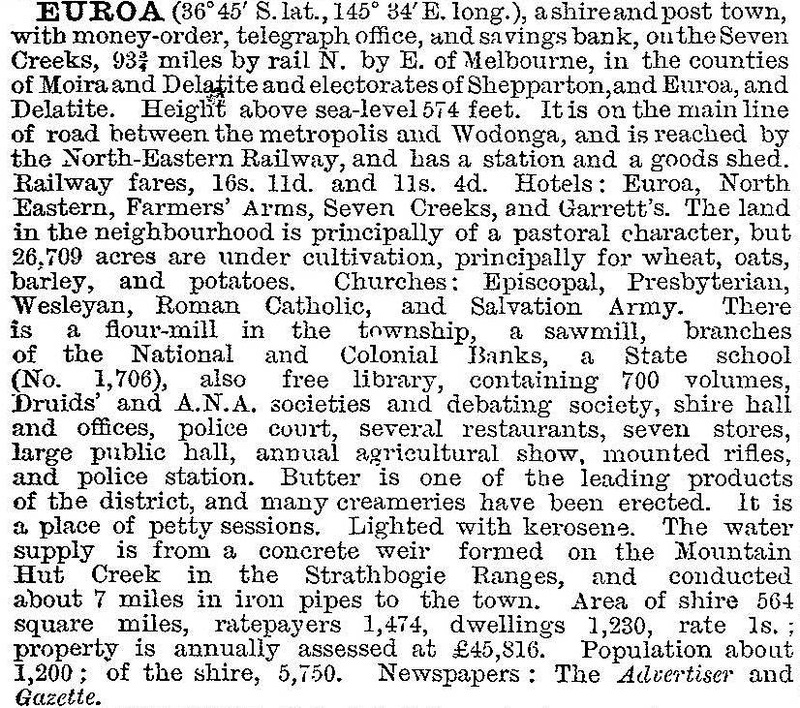 Euroa was also fortified by becoming the headquarters of a shire. Euroa Shire was created in 1879. It had an area of 2300 sq km and included Violet Town, Strathbogie and emerging closer settlement villages on the plains north of the Sydney Road and southwards in the Strathbogie foothills. Adequate care of roads in the Violet Town area was beyond the council, however, and Violet Town Shire was severed from Euroa in 1895. Euroa gained a higher elementary school in 1919, six years after Benalla's. Its local fame was strengthened by having three Victoria Cross winners, two from Gallipoli and one from the Boer War, which was understood to be a record for a provincial town. New buildings included a Catholic primary school (1921), a bush nursing hospital (1929) and a shire hall (1939). Sporting bodies were numerous during the 1920s and 1930s – twice-yearly race meetings, polo, a swimming enclosure on Seven Creeks, a picturesque oval for district cricket, golf, cycling, tennis, bowling and croquet club, coursing, and gun and rifle clubs. An athletic club began in 1934. Wool production increased as a proportion of Euroa's rural output. The Euroa butter factory closed in 1951. Euroa gained several manufacturing industries, one being Mrs Simons and Sons clothing factory (1944). The rabbit damage in the Strathbogie foothills was stopped by myxomatosis in 1952-53, and wool prices brought buoyant incomes. A high school opened in 1956 and by the 1970s its initial enrolment was doubled. Tourism became important, and when the Seven Creeks run was sold for $2 million in 1973 it was planned as a tourist development. The venture was wound up and sold in 1984. Euroa was one of the last towns to be bypassed by the Hume Freeway, a cause of some concern to local retailers who knew that their shopping centre did not match those in Benalla and Shepparton. Tourist promotion emphasised the ample picnic spots along Seven Creeks and the numerous examples of colonial architecture. The butter factory was restored in 2004 for functions and accommodation. In any event the population of the town and shire increased slightly during the 1980s. In addition to the recreational and civic facilities previously mentioned, Euroa has a showground, saleyards, hospital, elderly persons' homes (the population was relatively aged during the 1970s), picnic areas and a caravan park along Seven Creeks and an active shopping centre in Binney Street. About 25% of the town's employment was in retail and wholesale, reflecting its service centre role. The courthouse and a stone cellar building are on the Victorian Heritage Register. On 18 November 1994 most of Euroa Shire was united with most of Goulburn and Violet Town Shires and parts of Seymour rural city and McIvor Shire to form Strathbogie Shire. The balance of Euroa Shire was divided between Murrundindi Shire and Greater Shepparton.